Have you started thinking about Valentine’s Day decorations yet? 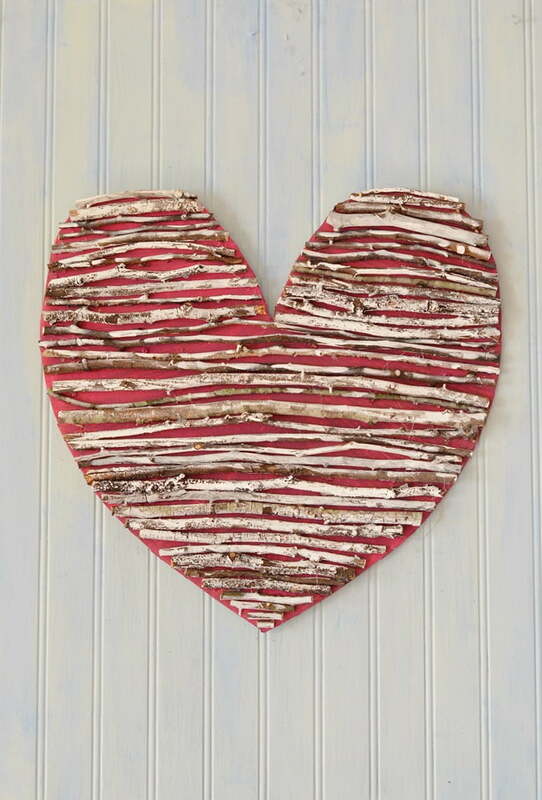 Quite frankly, food has been foremost on my mind, but I did take some time this week to make this rustic twig heart. 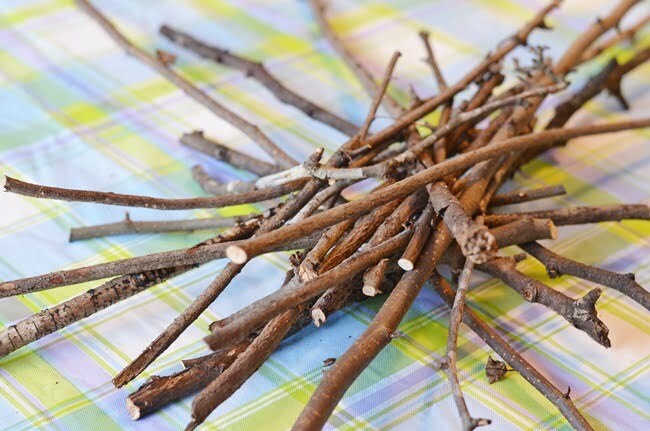 We have a lot of trees in our yard, and they are always dropping branches during the wintertime. While gathering up some, I got to wondering if I could make something with them. You already know how I love to make something out of nothing, right? It reminds me of the time when I was a little girl staying with my grandmother. I was whining that she didn’t have any toys there for me to play with. So she sent me out into the yard and told me to see if I could find something to make. Well, I found great big leaves and twigs and put them together to make “dolls.” I guess I’d have to thank her for encouraging my creativity but back then, they didn’t call it that. It was just their way of getting us out from underfoot, I think! 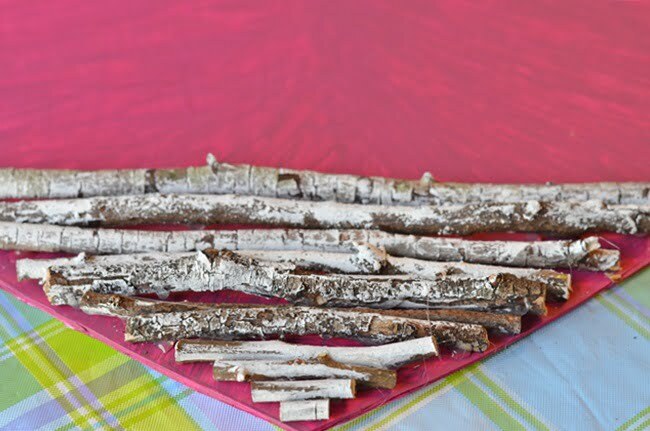 I started with a pile of about 30 twigs of various sizes. I gave them a little white-washing by using some watered down acrylic craft paint. 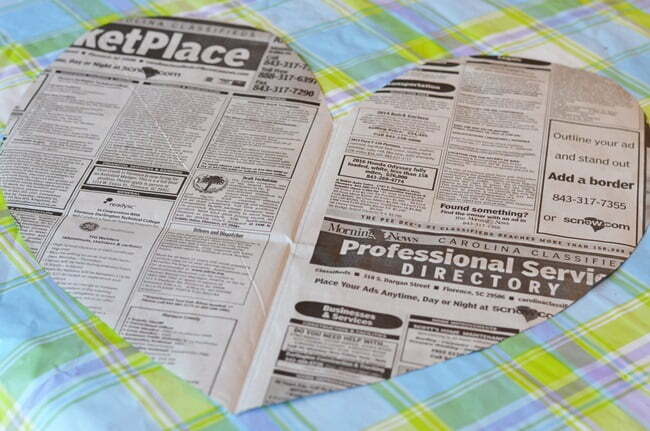 Next I created a heart pattern using newspaper. 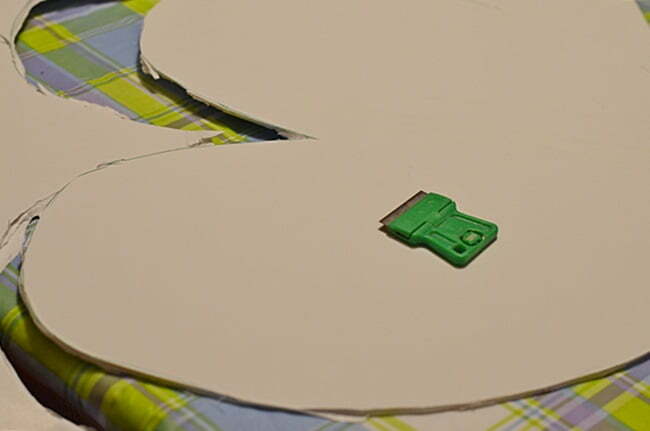 Then I traced the pattern onto some white foam board that I had on hand. I would probably have used balsa wood or thin plywood for this project but we live 15 miles from any place that sells something like that so I went with what I had! It would have been a little easier cutting it out with an X-acto knife but I used this scraper. 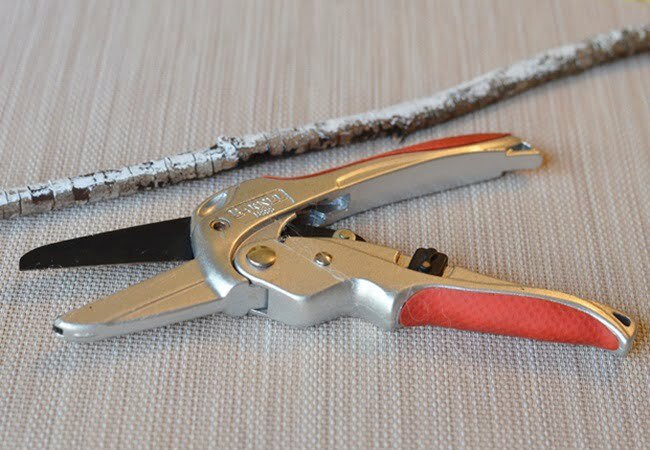 To cut the twigs to fit the heart, I used my hand pruners. As you can see, the heart-shaped foam board got a coat of red paint. 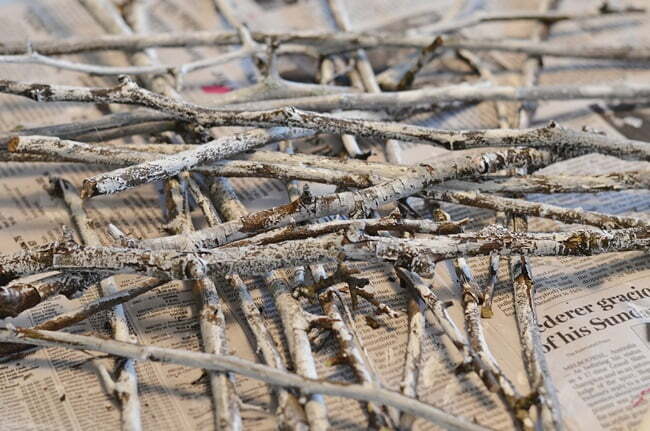 After the paint dried, I started hot gluing the twigs onto the heart. 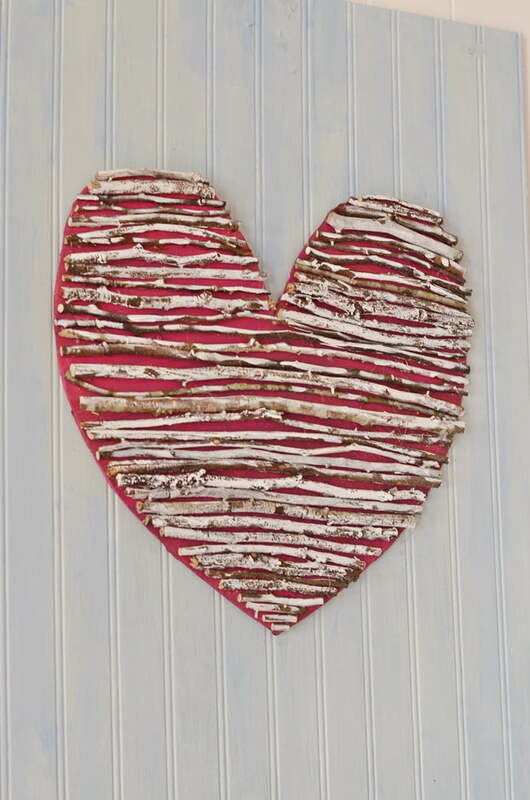 It didn’t take long to fill the heart with twigs, and I decided that I would attach the rustic twig heart to this piece of beadboard that I used in our Christmas decorations. Because the twigs added quite a bit of weight to the heart, I screwed it into the beadboard in 2 places. 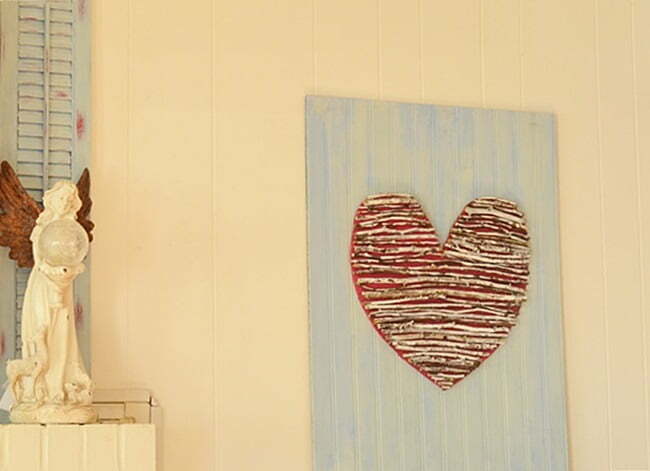 I am really digging the rustic contrast of the twig heart with the soft blue beadboard! 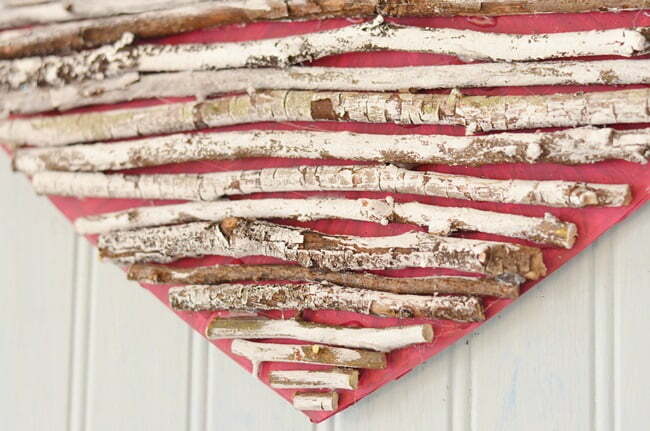 The rustic twig heart hangs here to the right of the fireplace where there are some blue shutters propped on the mantel. I thought about adding a bow or some ribbon or perhaps some letters that say LOVE, but then I decided that I liked the simplicity of the rustic twig heart. Hope you’re inspired to make something out of nothing! Going to make this and send it to my granddaughters in Minnesota. Thank you, Jane. I love the heart. It doesn’t need a thing. It says it all. Love it!!! Awesome idea! I’m going to use that idea to make the letter L for my front door! Love this project and it’s perfect for brightening up your porch on these dull winter days. The best things are the things made from virtually nothing. I love the twig heart! I like that Jane. Easy enough that I could probably take time to do it. Love your creative projects. 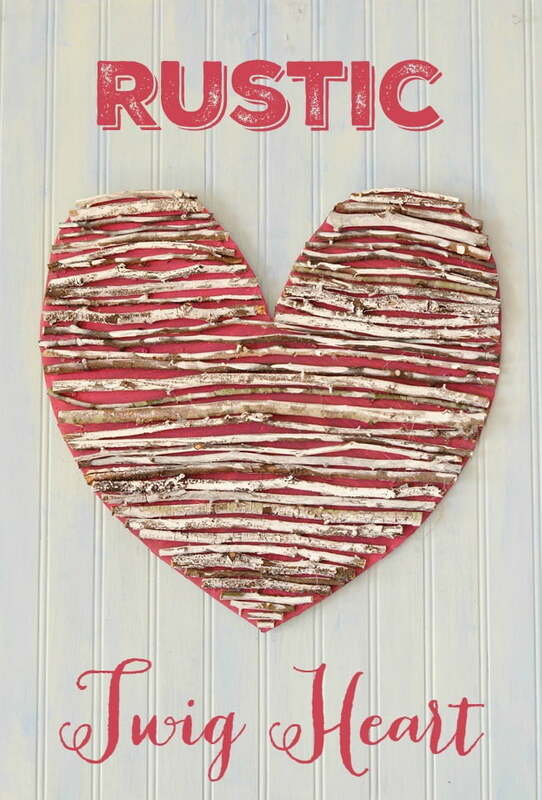 Jane, absolutely love the sweet twig heart, great idea, I think I’ll try this. This Twig Heart is the cutest!!! just love it. going to make on for my daughters apt. door its in side. glad to see a craft from you that almost free. have a great day. Love it especially on the light blue headboard. Simple did it. I love it! My Dad was a champion of making something out of nothing. Necessity is the mother of invention. Very sweet. I don’t have a lot of time for DIY stuff these days but I might just try this out as a gift for someone! Love it !!!! AND…. glad to see a post from Crossroads this morning !!! Blessed and happy weekend to you guys!! So cute! Love the red paint bleeding through! Never thought about making something from nothing! You are so clever! Didn’t that turn out well?!! Such a simple but charming statement. Thanks for sharing.